January 18, 2018 — SEAFOOD NEWS — In a step towards balancing sustainable scallop fishing and environment protection, the National Marine Fisheries Service (NMFS) has approved the majority of Omnibus Fish Habitat Amendment 2 (OHA2). The Fund is praising NMFS’ decision, saying that it creates “new opportunities for the successful scallop rotational management system.” However, they also have some concerns. This story originally appeared on Seafoodnews.com, a subscription site. It is reprinted with permission. The National Marine Fisheries Service’s (NMFS) decision to accept the majority of Omnibus Fish Habitat Amendment 2 (OHA2) is a significant step forward in balancing sustainable scallop fishing and environmental protection. NMFS approved the New England Fishery Management Council’s well-documented recommendations for habitat closures in the Great South Channel and western Georges Bank. These closures will provide critical protections for species like Georges Bank cod, and will provide dramatically more protection for critical habitat than the nearly 20-year closures that they replace. OHA2’s rebalancing of habitat management both allows for greater habitat protection and restores access to historically productive scallop grounds. It creates new opportunities for the successful scallop rotational management system, which has made the scallop fishery one of the most successful and sustainable fisheries over the last 20 years. Allowing new access to abundant areas such as these has also proven to be the best way to limit adverse environmental impacts from scallop fishing. NMFS estimates these measures could contribute well over $100 million in scallop landings in the short-term for coastal fishing communities – news that FSF welcomes. But the Council’s work is not done. NMFS rejected innovations in habitat management in the eastern portion of Georges Bank that would have allowed access to a portion of what is known as the “Northern Edge,” an area that contains some of the most historically rich scallop fishing areas in the world. Several generations of scallops have been born, lived, and died of old age since the last time fishing was permitted there. According to its decision memo, NMFS appears to have been seeking more information on how habitat-friendly rotational scallop fishing can be implemented to benefit both fishermen and habitat. In the meantime, the outmoded 20-year-old closures remain in place, despite zero evidence that these closures have done anything to promote groundfish productivity. In fact, the evidence suggests they have stymied economic growth and prevented optimization of scallop management. We are disappointed in the decision regarding eastern Georges Bank, but are hopeful we can take NMFS at its word that it is willing to work on refining a solution to restore Northern Edge access. January 15, 2018 — For seafood lovers, there’s nothing better than a lightly battered scallop, freshly harvested from the North Atlantic, and dipped in simmering butter. And now that federal regulators have agreed to open an area east of Nantucket, closed since the 1990s, fishermen could catch as much as $218 million worth of scallops this year, and $313 million over three years. Expect those fried scallop plates to cost less this summer. The reopening of the sea bed is just one of the many beneficial outcomes of a new fisheries management plan that was nearly 15 years in the making. The landmark set of regulations opens a large swath of the region’s waters to fishing while maintaining other closures to protect vulnerable species. The plan uses science and the latest technology to decide which ocean areas are important for the critical life stages of fish and shellfish species and how to protect them. Two decades ago, habitat closures were decided based on drawing a line around areas where fish were congregating. Now, with a model that compares the sea bed with the impact of fishing, regulators can make decisions that will help restore and protect fish stocks. The new plan also sets aside research areas to investigate the link between habitat and fish productivity. Cape fishermen are pleased with at least two elements of the plan. They cheered the closing of a large part of the Great South Channel that runs between the Cape and Georges Bank because it is essential habitat for spawning cod and other fish species. State and federal surveys have found that the region’s cod population has plummeted by about 80 percent over the past decade. Closing this area will now help ensure the continued survival of species like Atlantic cod, haddock, and flounder for years to come. January 8, 2018 — After 15 years of research and deliberation, federal fishing officials this week approved a landmark set of regulations that will open a large swath of the region’s waters to fishing while maintaining other closures to protect vulnerable species. The opening of one area east of Nantucket, closed since the 1990s, could be extremely lucrative, allowing fishermen to catch as much as $160 million worth of additional scallops in the coming fishing season, regulators estimate. Yet many in the industry had hoped that the National Oceanic and Atmospheric Administration would go further. Minkiewicz and others objected to the decision to maintain the ban on fishing on the northern edge of Georges Bank, where there are significant amounts of scallops but also vulnerable species such as juvenile cod. Minkiewicz said the industry would continue to press NOAA to reconsider opening those fishing grounds. “The scallop industry respectfully disagrees with [NOAA’s] conclusion that allowing limited scallop fishing [there] . . . was not consistent with the law,” he said. NOAA officials said that opening such areas could be harmful to some fish. After 14 years of research, negotiations, hearings and two additional years of review, New England has a plan that uses science and the latest technology to decide which areas are important for the critical life stages of fish and shellfish species and how to protect them. John Bullard, the regional director of NOAA’s Greater Atlantic Regional Fisheries Office, informed New England Fishery Management Council Chairman John Quinn in a letter Wednesday that his agency had approved most of their fish habitat protection plan. “It was a massive undertaking and your staff, especially Michelle Bachman, should be proud of their groundbreaking work that went into supporting this amendment,” Bullard wrote in the letter. The council staff, along with researchers from the National Marine Fisheries Service, state fisheries agencies, and universities, especially the University of Massachusetts Dartmouth’s School for Marine Science and Technology, put together models that incorporated photographic and other surveys of the ocean bottom with known areas of fish concentration and other research on spawning and other life stages, that helped the council evaluate what should be protected and how. “The fact that it dragged on so long, people miss how groundbreaking this really is,” said Tom Nies, the New England council’s executive director. Two decades ago, habitat closures were decided based on drawing a line around areas where fish were congregating, Nies said. Now, with a model that compares the sea bed with the impact of fishing, they can make decisions he feels will have greater significance to restoring and protecting fish stocks. Plus, the habitat plan also set aside research areas to investigate the link between habitat and fish productivity, a piece of the puzzle that has seen relatively little conclusive research. “If you compare where we are with this amendment in terms of how they were developed and analyzed versus the original habitat areas in 2002 and 2003, we are light years ahead of where we were then,” Nies said. Scallopers from both the big boat and small boat fleets, which are often at odds, traveled to Washington in October to lobby [U.S. Rep. William] Keating and other congressmen on getting NMFS to finish its review of the habitat plan and open the area up to scalloping before that population died off. Their message was that allowing them into scallop-rich, nonessential fish habitat meant they spent far less time towing their heavy dredges through areas fish do use. “From our perspective, it’s really heartening that they heard our concerns,” said Seth Rolbein, director of the Cape Cod Fisheries Trust, speaking for the Cape Cod Commercial Fishermen’s Alliance. David Frulla, an attorney and lobbyist representing limited access scallop vessels, and Fisheries Survival Fund attorney Andrew Minkiewicz agreed the council and NOAA made the right decision in closing the Great South Channel and opening the scallop grounds in what is known as Closed Area I. But they felt that there was just as much evidence to open up a portion of a second closed area on Georges Bank over 100 miles east of the Cape that had historically produced as much as 50 million pounds of harvested scallops. Bullard said more information would be needed for his agency to do that right now. “There are only so many highly productive scallop beds, and this is one of them,” Minkiewicz said. Frulla admitted that the bottom there is more complex and may be harder to determine its value to fish, but Minkiewicz said adding another prime scallop area keeps scallopers away from the bottom where fish do congregate. Assistant Regional Administrator Michael Pentony told Quinn in an email that his agency expected to publish the final rule containing the regulations to implement the plan this spring. August 4, 2017 — New Bedford, Massachusetts scallop distributor and processor Northern Wind has received certification from non-profit Fair Trade USA for fresh scallops. The processor has placed the scallops in stores run by the midwest grocer Hy-Vee, a longtime Northern Wind customer. The status goes a step beyond other sustainability frameworks like the Marine Stewardship Council (MSC) to consider social and labor aspects of trade, George Kouri, the company’s co-CEO, told Undercurrent News. Under the concept of “fair trade,” the growing conditions of products typically seen as commodities such as coffee or bananas are monitored by a third-party and assessed to higher labor and social standards than those that would otherwise occur in the market. Small-scale producers are often paid higher wages for the products, which are marketed accordingly and carry a premium price. In the case of scallops — which have enjoyed strong pricing lately — some of the proceeds from the fair trade system will go to fund community projects, education, the Fisheries Survival Fund and other worthy efforts, Kouri said. April 26, 2017 — President Trump on Wednesday will issue a sweeping executive order to review as many as 40 national monument designations made by his three predecessors, an unprecedented move that could curtail or rescind their protected status. It was unclear which areas would come under review, but the list could include monuments designated last year by President Barack Obama, including thousands of acres of pristine woods in northern Maine and sensitive marine habitats in the submerged canyons and mountains off Cape Cod. Environmental groups immediately questioned the president’s legal authority to reverse a previous president’s designation, but the Trump administration has suggested that some of the restrictions on mining, logging, and other commercial and recreational activities have gone too far. “The review is long overdue,” US Interior Secretary Ryan Zinke said at a White House news conference. “No one can say definitely one way or another whether a president can undo an earlier president’s designation, because the issue has never been litigated,” said New Bedford Mayor Jon Mitchell, who has opposed Obama’s closing of 5,000 square miles of seabed to fishing by designating the Northeast Canyons and Seamounts Marine National Monument, about 130 miles off Cape Cod. Mitchell said there is precedent for presidents to change the boundaries and activities within a national monument. President Woodrow Wilson reduced by half the size of the Mount Olympus National Monument in Washington, created by President Theodore Roosevelt. “Intuitively, one would assume that if the president can establish a monument, the president can undo an earlier establishment,” he said. Andrew Minkiewicz, an attorney at the Fisheries Survival Fund in Washington, D.C., said the president wouldn’t have to rescind Obama’s designation to address the concerns of the fishing industry. “With the stroke of a pen, he could just say there’s no longer a ban on commercial fishing,” he said. Atlantic sea scallops remain one of the most sustainably harvested stocks in the United States. With recent media attention on scallops in the northern Gulf of Maine (NGOM), the Fisheries Survival Fund, which represents the majority of the full-time Limited Access scallop fleet, has produced a fact sheet clarifying the true status of scallops in the region. Recent data from the New England Fishery Management Council, which is responsible for sustainably managing the region’s scallop population, shows that Atlantic sea scallops in the NGOM are not overfished, nor are they experiencing overfishing. The Limited Access fleet is operating within its allocated federal quota, and the Atlantic sea scallop fishery remains certified as sustainable by the Marine Stewardship Council. 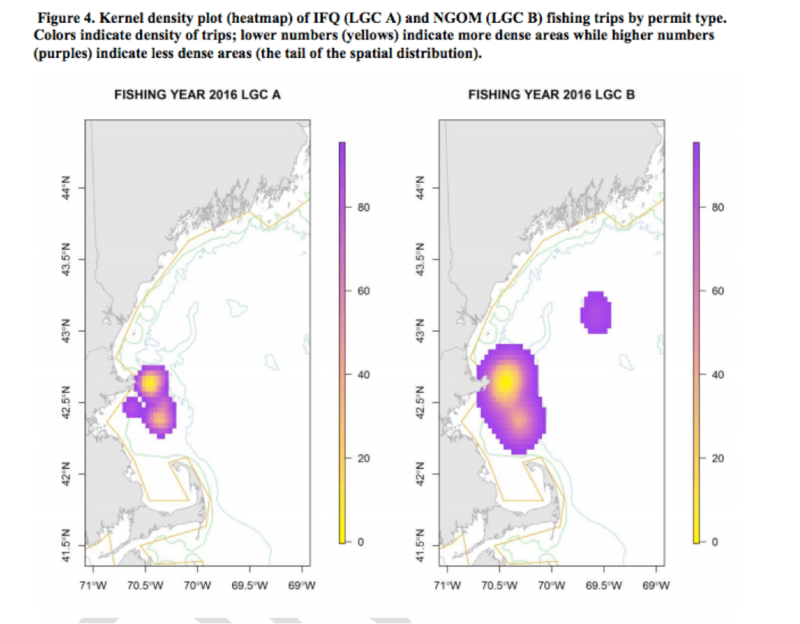 It also shows that most fishing in the area does not actually take place in the geographical NGOM, but rather in southwestern Stellwagen Bank, off the coast of Massachusetts. There are currently 36 active NGOM scallop fishing vessels in the NGOM, only 18 of which are home-ported in Maine. We have provided a fact sheet below using the official documents in order to clarify these claims. There is no overfishing of the Northern Gulf of Maine (NGOM) scallop stock, nor is it rebuilding, as scallops in the NGOM are not considered a separate, unique stock. There are not separate reference points for NGOM scallops, nor are there separate Annual Catch Limits. For all management and scientific purposes, NGOM scallops are part of the overall scallop stock, and are included in the full scallop assessment. According to that assessment, scallops are not overfished and are not experiencing overfishing. There are 81 NGOM permits and only 36 active NGOM scallop vessels fishing in NGOM. Out of those, only 18 are home-ported in Maine. This can be verified in Table 4 below, which was obtained from the New England Fishery Management Council website, from the March 1 meeting of the Scallop Plan Development Team. The table can also be found in section 3.2.1 of Draft Discussions Document on NGOM management. Most of the scallop fishing activity in the NGOM does not occur near Maine, but offshore Massachusetts, in the southwest corner of Stellwagen Bank. Some of this activity is outside the actual NGOM management area. A table illustrating this can be found below, and can also be found in the Draft Discussions Document on NGOM management in section 3.1. 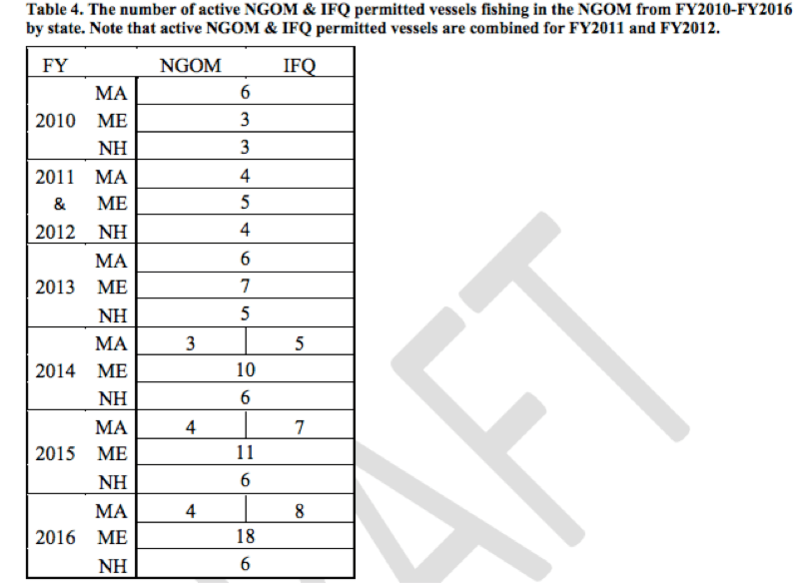 The fishing activity of the limited access scallop fleet in the NGOM does not count towards the quota of the NGOM. The limited access fleet operates on a federal quota, in federal waters, under an entirely separate management system. This is not new: the limited access scallop fleet has been fishing in this area under this management program for many years. The Atlantic Sea Scallop fishery is certified as sustainable by the Marine Stewardship Council. The scallop fishery’s commitment to sustainability is also reflected in their participation in the Research Set Aside program. Every year, a portion of revenue from the scallop catch is redirected towards research, which allows the scallop fishery to be managed by the most up-to-date science. March 2, 2017 — An executive order by President Donald Trump designed to radically cut back on federal regulations has spurred disagreement among fishermen about how it will affect them – and lawmakers and regulators aren’t sure what the answer is. Groups that represent both commercial and recreational fishermen are divided over whether President Trump’s “one in, two out” approach to federal regulations will benefit their industry, harm it or not affect it at all. In North Carolina, Jerry Schill, executive director of the N.C. Fisheries Association, an industry advocacy group dedicated to promoting the state’s seafood industry, said he’s been exchanging emails with fishing interests from all around the country about the matter. The FSF is a fund established in 1998 to ensure the long-term sustainability of the Atlantic sea scallop fishery. The fund works with academic institutions and independent scientific experts to foster cooperative research and help sustain the fishery. February 16, 2017 — A federal judge has denied a bid by commercial fishermen to stop the lease of the nearly 80,000-acre New York Wind Energy Area to Statoil, ruling the fishermen failed to prove imminent harm, and that the project is still subject to years of review before construction. “The court maintains its authority to ultimately enjoin the lease in this litigation if necessary,” U.S. District Court Judge Tanya S. Chutkan wrote in her opinion. The fishing industry argument that Statoil Wind US LLC will have made significant investments in the project – establishing property rights – during the Bureau of Offshore Energy review is not compelling enough to justify a preliminary injunction against granting the lease, Chutkan found. Statoil’s investment – including a record-setting $42.5 million bid for the lease – is being made with full knowledge that it may not get approvals or ever build the project, Chutkan wrote. Fishermen said they will continue to pursue the case on merits.